For users of the Chemical Reaction Engineering Module, COMSOL Multiphysics® version 5.2a brings a new Reacting Flow multiphysics interface to couple fluid flow and reactions in gases and liquids, as well as capabilities to model surface species reactions in the Reactive Pellet Bed feature and export surface reaction kinetics in the Reation Engineering interface. Continue reading for a complete list of updates to the Chemical Reaction Engineering Module. The Reactive Pellet Bed feature now allows you to model surface species reactions using the Surface Reactions functionality. Available in the Transport of Diluted Species interface and the Transport of Diluted Species in Porous Media interface, surface species are assumed to be adsorbed (immobile) at the pore walls inside the porous pellets. You can model any number of surface species and their corresponding reactions. The surface concentration inside porous particles forms a catalytic bed (concentration at the surface of the pores inside the pellet), simulated using the Reactive Pellet Bed feature. A bulk species is transported past and through catalytic porous particles. The species reacts on the fluid-matrix interface inside the pellets that form the particle. 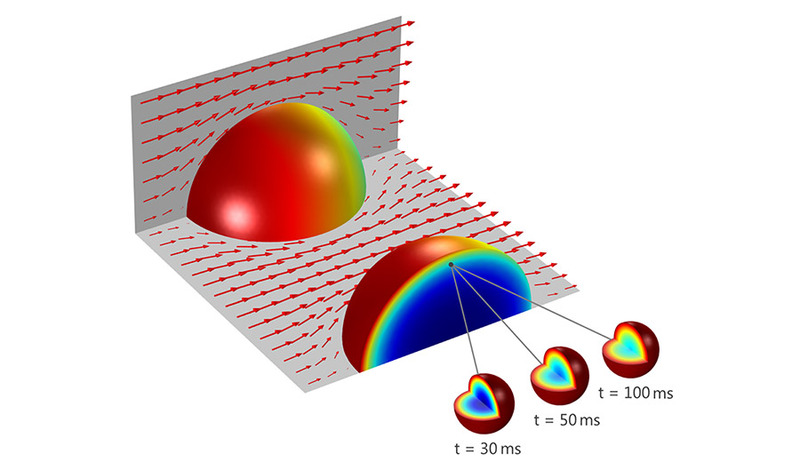 The velocity of the bulk fluid and the surface concentration are visualized. The resulting average surface concentration in the porous particle is shown together with the concentration inside a single pellet at a particular position and at three different times. You can now export surface reaction kinetics, defined in the Reaction Engineering interface, to a space-dependent model where the surface reactions occur inside porous pellets. 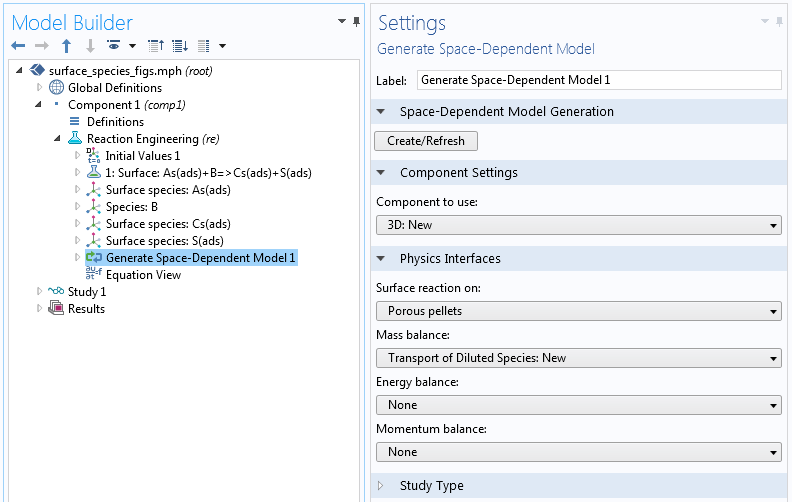 The Generate Space-Dependent Model feature exports the reaction kinetics and automatically defines material properties in a Reactive Pellet Bed feature. Surface reactions are exported to a Reactive Pellet Bed feature using the Generate Space-Dependent Model feature in the Reaction Engineering interface. 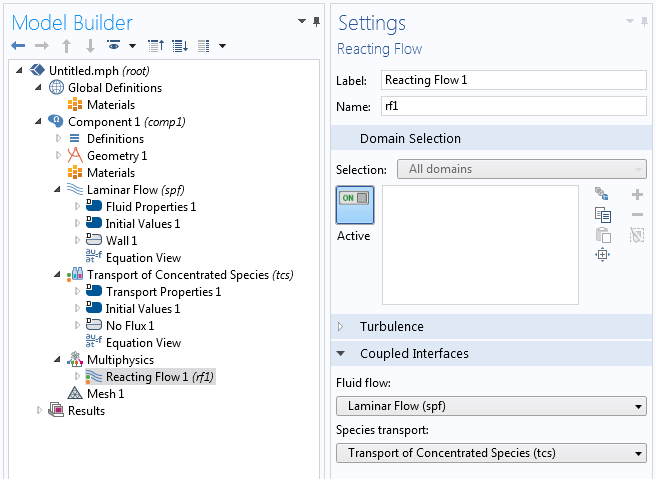 In the new Reacting Flow multiphysics interface, the Reacting Flow node, under the Multiphysics node, couples a Single-Phase Flow interface with a Transport of Concentrated Species interface.